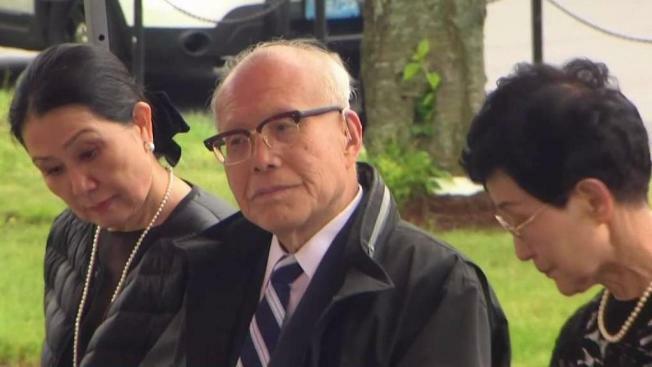 81-year-old Shigeaki Mori attended the dedication of a memorial to the 12 Hiroshima POW’s in Lowell, Massachusetts on Memorial Day. For 81-year-old Shigeaki Mori, commemorating Memorial Day here in the U.S. has been decades in the making. “I was eight years old when hit in the atomic bomb,” Mori said through a translator, explainging he was just a boy when he survived the atomic bomb in his hometown of Hiroshima, Japan. As he grew older, Mori began researching the victims, and was touched by the largely untold story of 12 American POW’s who died in the nuclear attack. “It’s very emotional, I’m just glad that he’s here,” said Susan Brissette Archinski. Brissette Archinski’s uncle Normand Brissette – a 19-year-old from Lowell – was one of those POW’s Mori sought to memorialize. And that’s what brought him here to Brissette’s hometown – receiving a key to the city of Lowell as a thank you for the sacrifices he made for the Brissette family and many others, like the family of POW Ralph Neal of Tennessee. In addition to the dedication of this memorial to the 12 Hiroshima POW’s, Mori will be attending screenings of the documentary about his mission – “Paper Lanterns” – at the Museum of Fine Arts in Boston and the United Nations in New York.